There are plenty of applications, resources or services out there that can help make your life as a web designer easier. I’ve used many different ones over the years, and there are some I keep coming back to. This is a personal list, and I would love to hear about any alternatives that you’ve found useful too! One of the most important things in your life (both personal and professional) is your time. There is a finite amount of it and keeping track of what you have to do and by when is vital. For me personally, I love Asana. It allows me to create projects with tasks, invite guests or team members and assign them tasks or keep them updated on what’s going on. Asana originally started off as an in house pet project in Facebook, but since then it really has grown in strength and usability. It’s very powerful, but keeps things simple. I would be lost without it. The free account is actually quite feature rich and useful, so there is no reason not to give it a try. I don’t know about you, but getting the right color scheme has always been a bit of a weak point for me. To that end I have always used a color wheel to help me choose complimentary or contrasting colors. 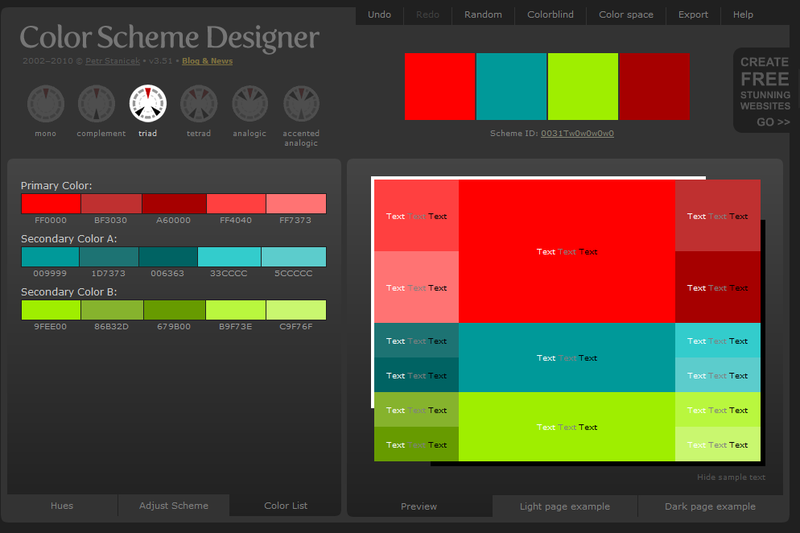 There are several great sites that automate this process, and the one I generally turn to is Color Scheme Designer. It keeps choosing a color palette a simple task, pick your primary color and adjust the dots until you find what you’re looking for. It has several presets and allows you to preview your choices. It doesn’t get much easier then that. just because I think it’s cool or it’s the last technology doesn’t mean I should use/do it. Making something simple, doesn’t mean making it stupid. If you have a dark background, go for a light colored text. Don’t put a different shade of gray on a gray background! Always, always use a contrasting color to make it easy to read. I know this one sounds obvious, but it happens all the time. Making sure a site performs well is very important, if it feels sluggish users won’t hang around. There’s a few sites and tools that can help you with this. But I find WebPageTest to be one of the better ones. It allows you to test different scenarios for load time based on browser and location and shows you an accurate time line. The best part is it suggests what you can do to improve your sites performance. One of the recommendations will almost certainly be a CDN or Content Delivery Network. The purpose of a CDN is to serve content such as images from locations close to the user. This helps reduce load time and improve responsiveness. I’ve used MaxCDN on a few projects and found it very good. If you’re using a CMS like WordPress, you can use one of the excellent caching plug-ins to ensure you’re doing everything you can to eek out that last bit of performance. 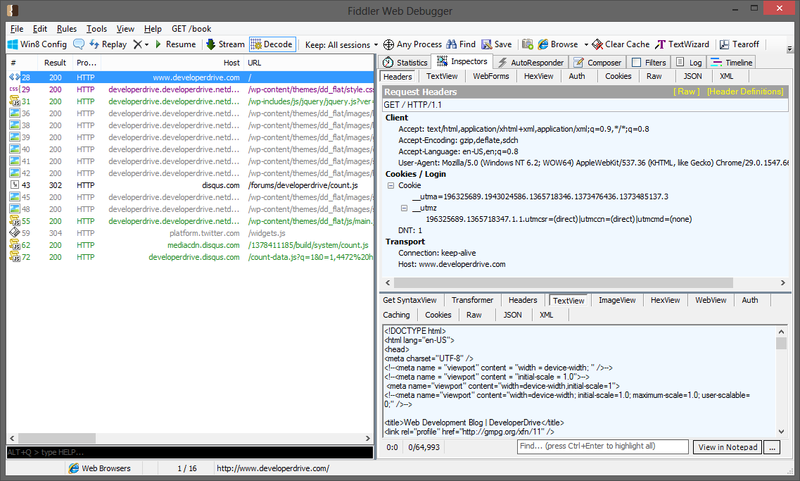 If you do a lot of work with 3rd party APIs you’ve probably already heard of Fiddler. Fiddler installs a local proxy to allow you see exactly what is being sent and returned by the various web requests on your site (or any site for that matter). You can even use it to build up or fix requests to test to help you find out why you’re not getting your tweets back from twitter or whatever API it is you’re working with. I’ve saved myself countless hours by being able to what’s going on and where I am going wrong.